Let’s be honest. 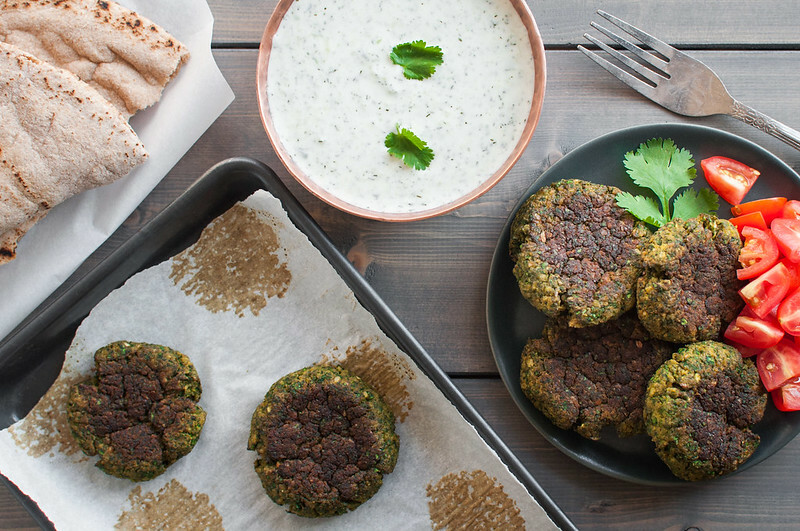 Falafel is one of those rare foods that’s better left to takeout. Convincing start to a blog post about homemade falafel, right? Usually, though, it’s pretty economical to order five sides of falafel from your local Greek or falafel-specific takeout spot, and it’s farrrrrr easier than soaking chickpeas overnight. 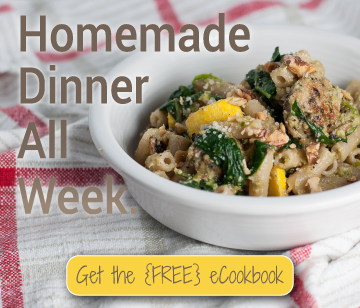 When you’re planning weeknight dinner on the fly, who has time for that??? Not even me, a food-crazed blogger and personal chef. The one time I’ve made “authentic” falafel, they were delicious. I used the recipe from Joy of Cooking and fried those babies to a gorgeous golden crisp while entertaining myself at home alone one night. Apparently two nights, since I had the foresight to soak the chickpeas. Tasty as they may have been, they admittedly still used some flour as a binder and were fried up in oil, much like the takeout variation. But falafel is amazing, and I would like to eat it more than twice a year without feeling guilt and a pile of somewhat greasy chickpeas sitting it my tum for the subsequent six hours. 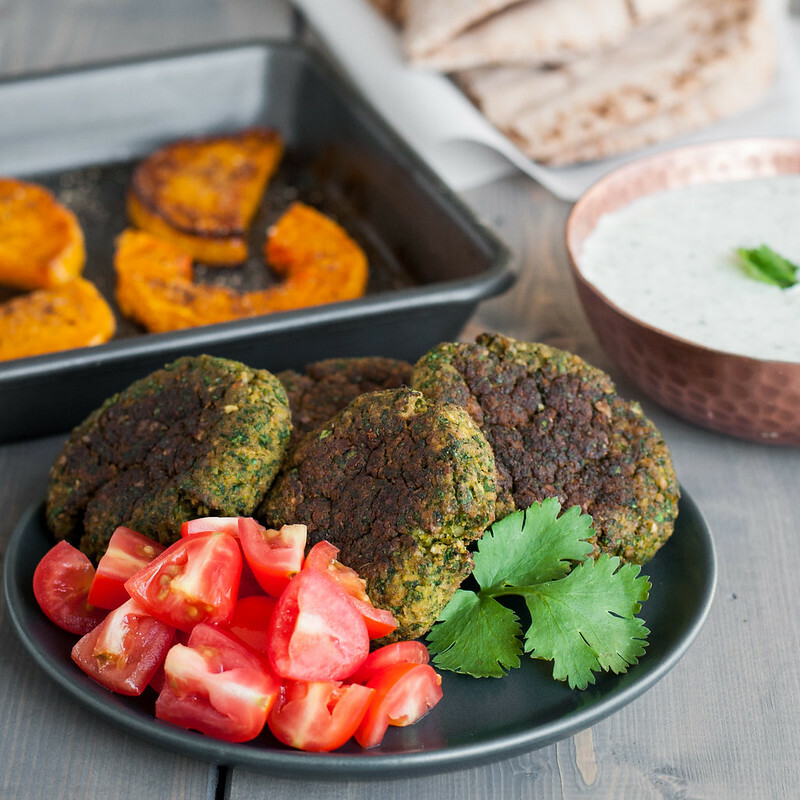 Enter–baked green gluten free falafel. 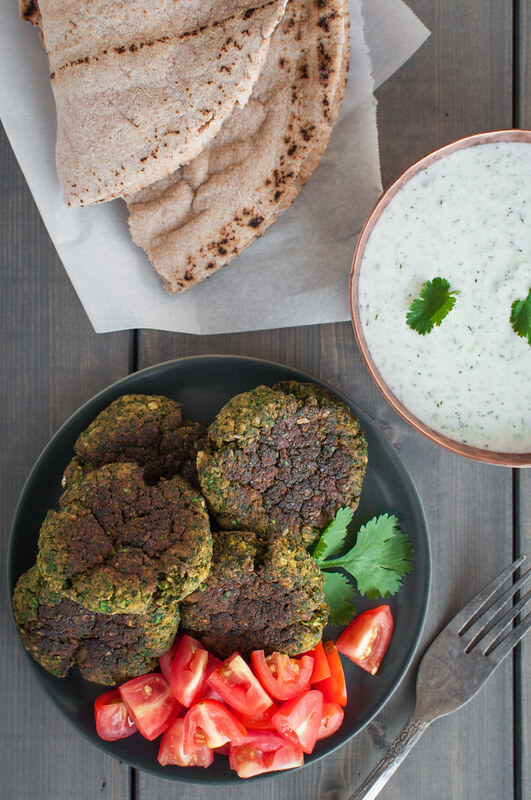 Cilantro and parsley give these gluten free falafel tons of flavor and color. If you don’t like one herb or the other, you can easily use just one type, or whatever looks best at the grocery store (or, if you’re lucky, from your herb garden). To save me from some hateful comments, I’ll openly admit that using canned/cooked chickpeas is not the authentic preparation. I’m not a Mediterranean cuisine expert, just lover, so feel free to share your experience if you’re a seasoned falafel cook. That said, the flavor and texture of these baked falafel patties barely strays from Greek restaurant variations. Yes, you are missing that super crunchy fried exterior, but cleanup is almost non-existent, and the patties still form a slightly crisp, browned exterior from baking. Unlike baked versions I’ve tried, and choked down, before, these falafel are relatively sturdy and moist. They held together like champions when wrapped in a pita, covered in tzatziki, and jostled roughly. If you need a tzatziki recipe, my favorite is in my eCookbook that I send to all email subscribers. My natural inclination is to make a falafel wrap dinner complicated, providing every conceivable condiment and topping. 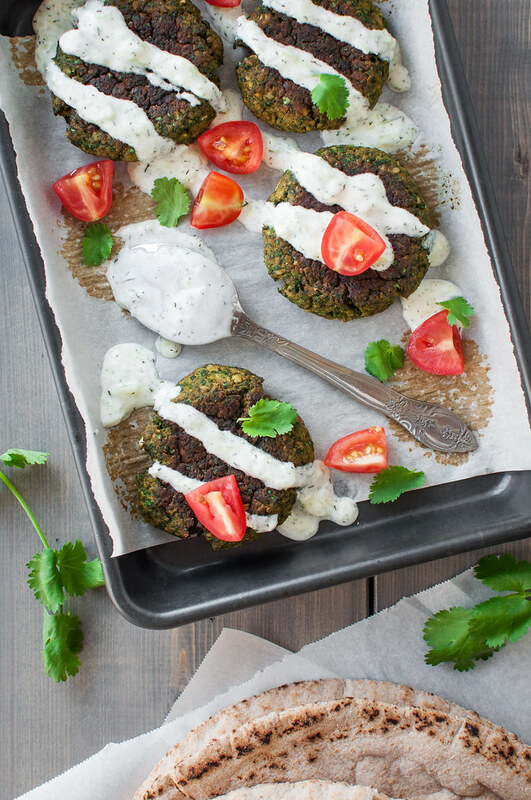 For the sake of ease and speed, though, I kept it simple when I served these things for a weeknight dinner: gluten free falafel, pita bread, fresh tomatoes, tzatziki. 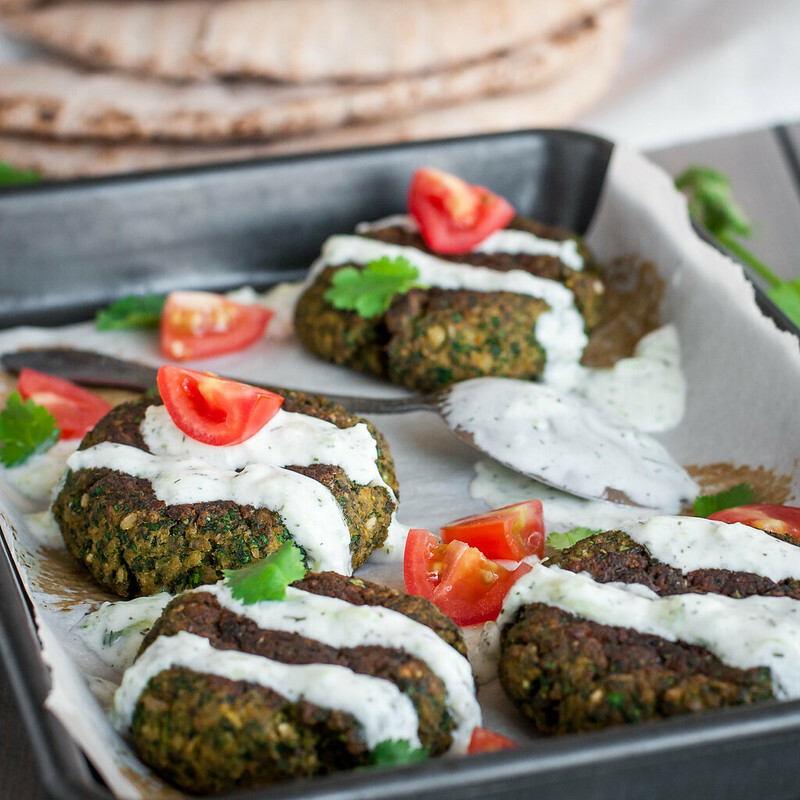 It was exactly what I was craving, the cool, herbed tzatziki complementing the warm spices of the falafel. With tomatoes thrown in for juiciness, of course. And yes, I do realize that whole wheat pita bread (I got mine at TJ’s) negates the benefit of gluten free falafel. Ha. Silly me. Luckily, grocers in every corner of the country should have gluten free pita options for you to keep this dinner quick and gluten free, or you can even make your own. 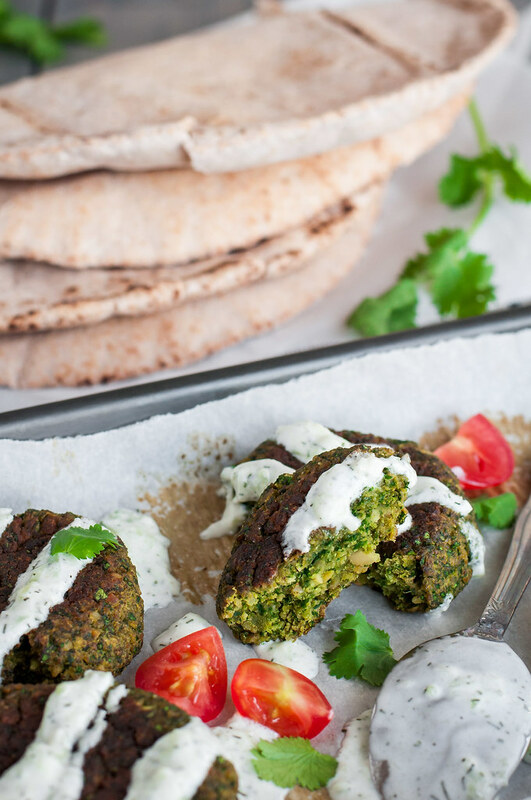 A vegan falafel recipe seems especially appropriate to share on NCK today, given that I just finished reading Finding Ultra, Rich Roll’s pre-podcast memoir, in approximately a week. Steve was quick to point out as I wrapped it up last night that, “That’s the fastest you’ve ever read a book!” I read for comprehension, not speed, okay?? Shout out to my fellow slow readers. Anyway, after years of listening to Rich’s inspiring podcast, I thought it was about time I read the full story of how he transformed from cheeseburger-eating, alcoholic lawyer to sober ultra-athlete and plant power ambassador. Mostly, the book features Rich’s vulnerable account of his story, and since his diet plays such a significant role, he talks just enough about his vegan lifestyle to be informative, not annoying (note, this is not a sponsored post, just my own opinions). If you like hard facts and science and are thinking about shifting to a more plant-centric diet, I’d highly recommend the book. Personally, I don’t need convincing. This week I prepared a few unintentionally totally vegan dinners at home, including sweet potato and brown rice stir fry bowls with peanut sauce, these gluten free falafel, and last night’s paprika-spiced Spanish potatoes, served with romaine salad and tangy avocado dressing. And you know what? They were some of my favorite dinners to date, and I feel amazing. In the face of a few hard workouts and severe seasonal allergies, eating healthy dinners (and breakfasts and lunches) has given me a boost to fight off sore legs and drowsiness. Why am I preaching all this? There are a lot of “viral” vegan recipes out there right now, and sure, it’s trendy. While I love for you all to discover my recipes when they hit on keywords like “vegan” and “gluten free”, it’s kind of empty to write vegan recipes just for the sake of saying they’re vegan, or whatever the special diet du jour is. I feel much better giving you the story of how a recipe worked for me in real life, in hopes that it might work the same for you. Pulse onion and garlic in a food processor until minced. Empty, with any juice from the onion, into a medium mixing bowl (you should have around 1 cup). Roughly chop the herb leaves so they'll fit into the food processor. Add herbs, chickpeas, salt, pepper, and spices to food processor and run until there are no large chunks. Stop to scrape down sides of processor as needed. Add back onion and garlic, almond meal, potato starch, and baking soda and pulse until nearly smooth and uniformly green. If the mixture is really dry and won't process, and up to 3 tablespoons water, 1 tablespoon at a time. Turn mixture back into the mixing bowl and stir or knead in almond flour, potato starch, and baking soda. Taste and season, if needed. Cover the bowl and refrigerate 30 minutes. Preheat oven to 400 degrees (F) and line a baking sheet with parchment paper or silicone baking mat. Quarter chickpea and herb "dough", then divide each quarter into four equal pieces. Roll each piece into a ball, place on baking sheet, then use fingers or back of a spatula to flatten each ball to about ½" thick and 2½" in diameter. Bake 15 minutes, then gently turn each patty over. Bake another 10 to 15 minutes until browned on both sides and firm. Serve warm or room temperature, alone or in pita bread, with tzatziki, tomatoes, or your condiments of choice. 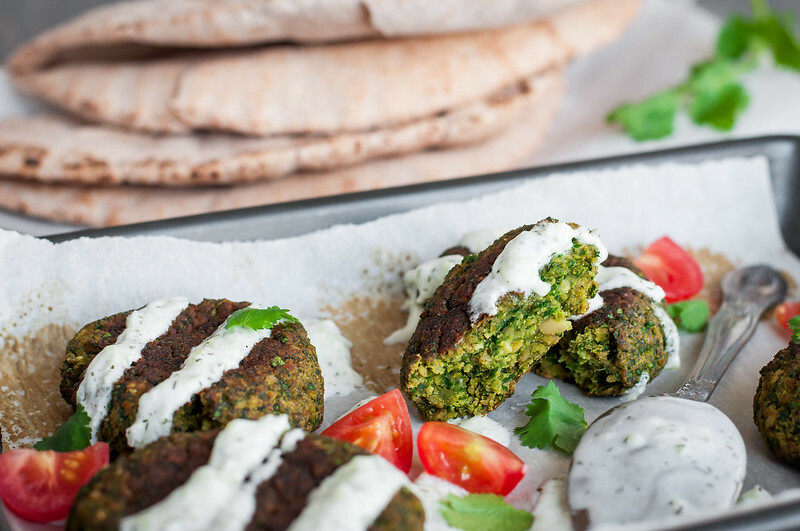 Falafel are gluten-free and vegan, when prepared without substitutions. Yields 16 individual falafel patties. Prep and cook times don't include inactive resting time in refrigerator for the dough. Note: This page contains affiliate links. It does NOT contain sponsored content. Affiliate links (to products I recommend, on Amazon) offset my ingredient and website maintenance costs, so I can keep bringing you Mediterranean recipes like this one. Thanks! Can’t wait to try these! I am not familiar with potato starch. Where would I find it in a grocery store? Is there something I could substitute or could I just leave it out of the recipe? Hi Marcie–you should be able to find it with the gluten-free flours/baking products at grocery stores in most parts of the country. If not, use the link in the ingredient list to buy it on Amazon. I wouldn’t recommend leaving it out entirely, but if you can find tapioca starch (or possibly arrowroot) instead, that would make a good substitute. Let me know how it goes!